DIRECTIONS: From Route 11 in Malone, turn south on Webster Street for .5 miles. The cemetery is on the east side of the road behind a cedar hedge and padlocked fence. Webster Street Cemetery has been transcribed at least three separate times. The first transcription was compiled by Hugh and Woody McLellan in June of 1952. The second transcription was compiled 20 June 1961 by members of the D.A.R. (Daughters of the American Revolution). It does not appear that they had access to McLellan's listing compiled nine year earlier. The third transcription was compiled by Virginia Anne WOLFE. Utilizing obituaries found on microfilmed copies of local newspapers, she tried to verify some of the data found in the D.A.R. transcription. This information is no longer a true transcription. Additionally, it has been necessary to reformat Anne WOLFE's transcription to some extent. If you find one of your ancestors listed here, I strongly urge you to visit the cemetery yourself to check the stone. 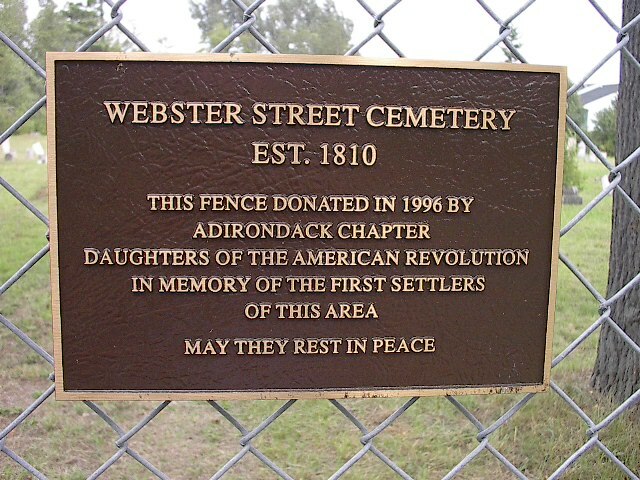 Webster Street Cemetery is surrounded by a 10-foot high fence which is kept locked due to vandalism. To obtain a key, you will need to make arrangements with the First Congregational Church, 2 Clay Street, in Malone. Their telephone number is 518-483-3950. The Town of Malone office (near the airport) has in its Assessor's Office a detailed lot map of Webster Street Cemetery. "DAR strives to save buried history", Malone Telegram, 11 September 2007. Died Feb. 15, 1854 AE 31 yrs. Died 15 February 1854 Age 31 yrs. John ADAMS Died Nov. 5, 1852 AE 62 Yrs. Also his wife Martha A. Died May 13, 1861 AE 79 Yrs. Also his wife Martha Died May 13, 1861 AE 79 yrs. John ADAMS Died 5 November 1852 Aged 62 yrs. His Wife Martha Died 13 May 1861 Age 79 yrs. Abigail Wife of Majr. Joel AMSDEN Died May the 19th 1812 In the 33d Year of her age. Abigail Wife of Major Joel AMSDEN Died May 19, 1812 In the 33 yr. of her age. Abigail Wife of Major Joel AMSDEN Died 19 May 1812 Age 33 Yrs. Abigail Wife of Joel AMSDEN Died Sept. 12, 1855 In the 75 yr. of her age. Abigail Wife of Joel AMSDEN Died 12 September 1855 In her 75th yr.
Joel AMSDEN Died Aug. 23, 1831 In the 63 year of his age. Major Joel AMSDEN Died 23 August 1831 In His 63rd Yr.
Lewis H. Eldest son of M. S. and S. D. AMSDEN, of Greenfield, Mass. Killed by the fall of a tree on the 27th of Jan. 1833. Aged 21 yrs. Wm Henry Son of J. S. & S. C. AMSDEN Died Sept. 12, 1853 AE 10 mos. Malenda Wife of Honr. Cone ANDRUS, Esq. Died May the 27th 1809 in the 31st year of her age. Malenda Wife of Hon. Cone ANDRUS, Esq. Died May 17, 1809 In the 51 year of her age. Malinda Wife of Hon. Cone ANDRUS Died 17 May 1809 Age 31 yrs. Sacred to the Memory of the Honr. Cone ANDRUS Esq. Who departed this life Decr. 10th 1821 in the 47th year of his age. George H. ATWOOD Died June 15, 1901 AE 91 Yrs. 22 D.
Mary N. Wife of G. H. ATWOOD Died Feb. 23, 1873 AE 63 Yrs. 10 M.
George H. ATWOOD Died June 15, 1901 AE 91 Yrs. 22 Ds. Mary Wife of G. H. ATWOOD Died Feb. 23, 1873 AE 63 Yrs. 10 Mo. George H. ATWOOD Died June 15, 1901 Age 91 yrs. 22 dys. Mary Wife of G. H. ATWOOD Died 23 February 1873 Age 63 yrs. 10 mos. Alexander Died Apr. 24, 1866 Aged 1 m'o. Albert Died Apr. 1, 1868 Aged 8 m's. George H. Son of Edward & Margaret Aubery Died Dec. 1, 1878 In his 9th Year. Olive H. Died at Malone, Mar. 31, 1853 AE 1 y'r. & 10 mo's. Also Hiram P. Died at Malone, Aug. 3, 1853 AE 5 weeks & 4 d's. Abbie S. Daughter of John & Betsey BAKER Jan. 2, 1862 AE 3 yrs. Abbie / Abby S. Dau. of John and Betsey BAKER Died 2 January 1862 Age 3 yrs. 3 mos. Carrie E. Daughter of John & Betsey BAKER Died July 21, 1873 AE 11 yr. 9 m's. 3 ds. Carrie E. Died July 21, 1873 Age 1 yr. 9 mos. Carrie E. BAKER Dau. of John and Betsey BAKER Died 21 July 1873 Age 1 yr. 9 mos. 3 dys. Joshua Buried on "WOOD" lot. Joshua Died 15 December 1860 AE 75 Yrs. Died Oct. 29, 1861 AE 30 yrs. Gone but not forgotten. M. B. BASSETT Died Oct. 29, 1861 AE 30 yrs. M. B. BASSETT Died 29 October 1861 AE 30 Yrs. Joseph BATES Died April 11, 1861 AE ? McLellan is probably correct about this date. On the 1860 U.S. Census his 95 year old widow Lucy was listed, but not him. Therefore he probably died in 1842, not 1861. -- Submitted by John AUSTIN. Silvinia L. Daughter of Orin &. & Mehitable BEACH Died May 2, 1846 AE 1 yr. 1 Mo. & 9 ds. Silvinia L. Daughter of Orin and Mehitable B. BEACH Died May 2, 1846 AE 1 yr. 1 mo. 9 ds. Silvinia L. Dau. of Orin and Mehitable BEACH Died 2 May 1846 AE 1 yr. 1 mo. 9 dys. Wm. N. BEARDSLEY (or Wm. W?) Died Sept. 22, 1870 AE 23 Y'rs. James BEARDSLEY Died 31 January 1867 Age 81 Yrs. Elizabeth (DARBY) Wife of James BEARDSLEY Died 10 March 1879 Age 83 yrs. We part on Earth & meet in Heaven. Oliver BEARDSLEY Died 18 February 1876 Age 54 yrs. Mary Eliza His Wife Died 31 October 1872 Age 39 yrs. The 1860 U.S. Census, Malone, page 7, household #50 lists Ida F., daughter of Oliver & Mary BEARDSLEY, age 1 year. Therefore, the surname BEARDSLEY is probably correct. --Submitted by John AUSTIN. John Sherman eldest son of Simon and Lydia BECKWITH Died May 3, 1830 Aged 3 yrs. John Sherman Son of Simon and Lydia BECKWITH Died 3 May 1830 Age 3 yrs. Timothy BEMIS Died May 24, 1848 AE 72 Yrs. Timothy BEMIS Died 24 (May or March) 1848 Age 72 yrs. Timothy BEMIS' War of 1812 pension states he said May 24, 1848. --Submitted by John AUSTIN. Lois Wife of Timothy BEMIS Died Aug. 2, 1856 Aged 82 yrs. Gone home. Ebenezer BEMIS Died Oct. 27, 1862 AE 62 Y'rs. Ruth His Wife Died Oct. 24, 1886 AE 82 Y'rs. 1 Mo. Archibald GIBSON Died Feb. 4, 1887 AE 80 Y'rs. 5 Mos. Private in 142 Reg. N.Y.S. Vol. Alvira His Wife Died Mar. 12, 1890 AE 73 Y'rs. Ebenezer BEMIS Died Oct. 27, 1862 AE 62 Yrs. Ruth His Wife Died Oct. 24, 1886 AE 82 Yrs. 1 Mo. Archibald GIBSON Died Feb. 2, 1827 Aged 80 yrs. 6 mos. Alvira His Wife Died Mar. 12, 1890 Aged 73 yrs. Ebenezer BEMIS Died 27 October 1862 Age 62 yrs. His Wife Ruth (TRUMBULL) Died 24 October 1886 Age 82 yrs. 1 mo. Son Henry A. Died 2 May 1842 Age 10 mos. Since Archibald GIBSON served in the Civil War from Bangor, he could not have died in 1827 as the D.A.R. transcription suggests. -- Submitted by John AUSTIN. Henry A. Son of Ebn. And Ruth BEMIS Died May 2, 1842 AE 10 mos. Also Celia Florence Died Sept. 29, 1865 Aged 1 Yr. & 7 Mo. Ida Isabel Died Sept. 21, 1865 Aged 9 yrs. Celia Florence Died Sept. 29, 1865 Aged 1 yr. 7 mo. Isabel Died 21 September 1865 Age 9 yrs. Celia Florence Died 29 September 1865 Age 11 yr. 7 mos. Oved BERRY Died Dec. 26, 1830 Aged 30 Yrs. 1 Mo. Ovid BERRY Died 26 December 1830 / 36 (?) Age 30 yrs. 1 mo. Myron BERRY Died April 11, 1884 AE 35 Yrs. 3 Mos. 7 Ds. Myron BERRY Died 11 April 1884 AE 85 yrs. 3 mos. 7 dys. Chablana Wife of Myron BERRY Died April 12, 1872 AE 70 Y's. Charlana Wife of Myron BERRY Died Apr. 12, 1872 AE 20 Yrs. Charlana Wife of Myron BERRY Died 12 April 1872 AE 70 yrs. Malone Palladium newspaper says that Myron BERRY married Mrs. Charlana SANBORNE. He is the son of Ebenezer BERRY. Fred BERRY Died Aug. 9, 1819 AE 22 Ys. Irad BERRY Died 9 August 1819 Age 72 (?) yrs. Mercy BERRY Died April 16, 1862 AE 78 y'rs. Mercy BERRY Died Apr. 16, 1862 AE 78 Yrs. Mercy BERRY Died 16 April 1862 Age 78 yrs. Ebenezer BERRY Died May 15, 1837 Aged 64 Y'rs. He sleeps in death but lives with God. Demis Wife of Ebenezer BERRY Died April the 4th 1811 in the 36th year of her age. Demis Wife of Ebenezer BERRY Died April 4, 1811 In the 36 year of her age. Huldah Wife of Ebenezer BERRY Died May 14, 1870 AE 46 Yrs. Huldah Wife of Ebenezer BERRY Died 14 May 1870 Age 46 yrs. John Sherman Oldest son of Simon and Clydra (?) BICKNELL Died May 1836 Age 9 yrs. 6 mos. 7 dys. McLellan lists this stone underneath LODGE. Mr. Oliver C. BOOGE was instantly killed Sept. 6, 1815 in the 35 (?) year of his age. Oliver C. BOOGE Killed instantly on 6 September 1815 in his 35th yr.
Luther Son of Luther M. & Olive R. BRADDISH died July 26, 1828 Aged 4 yrs. Luther Son of Luther M. and Olive BRADISH Died July 26, 1828 Aged 4 yrs. Luther BRADISH Son of Luther M. and Olive BRADISH Died 26 July 1828 AE 4 Yrs. George Kinsman Son of George & Lucinda M. BRADLEY Died Sept. 8, 1849 AE 11 mo's. & 15 d's. Joseph BRANCH Died Dec. 20, 1892 AE 78 Yrs. Joseph BRANCH Died 20 December 1892 Age 78 yrs. Asenath Wife of Joseph BRANCH Died Jan. 25, 1885 AE 73 Y'rs. Asenath Wife of Joseph BRANCH Died Jan. 25, 1885 AE 75 Yrs. Aseneth Wife of Joseph BRANCH Died 25 January 1885 Age 72 yrs. Hiram S. Son of J. & A. BRANCH Died Sep. 26, 1855 AE 17 Yrs. Hiram S. Son of J. and A. BRANCH Died Sept. 26, 1855 AE 17 Yrs. Hiram S. Son of J. & A. BRANCH Died 26 September 1855 Age 17 yrs. Josephine M. Died May 12, 1906 Age 16 Yrs. Josephine BRUFFEE Died 12 May 1906 Age 16 yrs. Sarah Consort of Wm. BRUSH Esq. Died Oct. 1819 In the 63 year of her age. A worthy and beloved mother. Sarah Consort of Wm. BRUSH, Esq. Died Oct. 1919 In the 63 yr. of her age. Sarah Consort of William BRUSH, Esq. Died October 1919 In her 63rd yr.
Jessie BUMP Died Dec. 27, 1907 AE 62 Yrs. Jessie BUMP Died 27 December 1907 Age 62 yrs. Charlotte Dau't of J. W. & P. CARY Died Apr. 10, 1846 AE 4 mo. Charlotte Daughter of J. W. and P. CARY Died Apr. 10, 1840 AE 4 mos. Caroline A. Wife of E. R. CHANDLER Died Mar. 25, 1872 AE 58 Yrs. Caroline A. Wife of E. R. CHANDLER Died 25 March 1872 Age 58 yrs. Polly Wife of Edmond CHAPMAN Died Oct. 7, 1815 In the 30th year of her age. Polly CHAPMAN Wife of Edmund CHAPMAN Died 7 October 1815 In her 30th yr.
Helen His Wife Died July 3, 1883 In her 80th yr. Darling CLARK Died Jan. 20, 1857 In his 26 yr.
Salmon CLARK Died 9 January 1892 In his 93rd yr.
Helen His Wife Died 3 July 1883 In her 80th yr. Darling CLARK Died 20 January 1857 In his 26th yr. Darling CLARK Died 1 October 1820 Age 32 yrs. Judson Son of Jessi A. and Rhoda CLARK Died Sept. 27, 1824 AE 10 mos. John CLEVELAND Died 19 June 1824 Age 77 yrs. Mabelle V. Daughter of J. E. & L. L. COLLIER Died Sept. 14, 1861 AE 3 mos. & 26 dys. Roxana A. Daughter of J. E. & L. L. COLLIER Died Apr. 18, 1858 AE 3 mo's. & 7 d's. Louisa Wife of Jeremiah CONANT Died Dec. 20, 1857 AE 53 Yrs. Louisa Wife of Jeremiah CONANT Died 20 December 1857 Age 53 yrs. Lucia Melvina Daughter of J. & L. CONANT Died May 11, 1841 Age 9 yrs. & 7 mos. Lucia Melvina Daughter of J. & L. CONANT Died 11 May 1841 Age 9 yrs. 7 mos. Let me live the life of the righteous & let my last end be like his. Dr. C. CONANT Died 15 March 1842 Age 43 yrs. Azro CONANT''s obituary was published in the Malone Farmer on Wednesday, 23 March 1910. Horace D. CORNISH's obituary appeared in The Malone Palladium on Thursday, 28 Nov. 1889. Our little Freddie Son of O. B. & B. A. CORNISH Died Nov. 3, 1867 AE 3 yrs. & 8 ms.
Freddie CORNISH Died 1863 AE 4 Yrs. Freddie CORNISH Died 1863 Age 4 yrs. Philos CULVER Our Father Died Jan. 1849 Aged 83 yrs. Sarah CULVER Our Mother Died Dec. 28, 1840 Aged 68 yrs. Philos CULVER Our Father Died Jan. 1819 Aged 83 yrs. Sarah CULVER Our Mother Died Dec. 28, 1810 Aged 68 yrs. Philos CULVER Our Father Died January 1819 Age 83 yrs. Sarah CULVER Our Mother Died 28 December 1810 Age 68 yrs. Died April 20, 1827 AE 45 Yrs. Died 29 April 1827 Age 45 yrs. Wid. Judith Wife of John DAGGETT Died Mar. 23, 1813 In the 59th yr. of her age. Widow Judith Wife of John DAGGETT Died 23 March 1813 In her 59th yr.
Nathan DARLING Died Dec. 26, 1892 AE 84 Y'rs. Roswell A. DARLING Died Feb. 9, 1874 AE 35 Y'rs. Co. B 16th N.Y.S.V. Roswell A. DARLING Died Feb. 9, 1874 AE 35 yrs. Co. B 16th N.Y.S. Vol. Alexander S. Son of E. & R. DEWEY Died Dec. 11, 1842 Aged 1 Year 6 mo's. 25 dy's. Alexander DEWEY Son of E. and R. DEWEY Died 11 December 1842 AE 1 yr. 6 mos. 25 dys. Theodore G. DICKEY Died May 2, 1870 AE 32 Y'rs. Member of Co. A. 98th Reg. N.Y.S.V. Lydia R. Wife of Theodore DICKEY Died June 13, 1869 AE 23 ys. & 7 ms.
Joel DOW Died 13 December 1836 Age 63 yrs. 5 mos. Artemus EARL Died June 15, 1861 AE 65 Y'rs. Artemus EARLE Died June 15, 1861 AE 65 Yrs. His Wife Died Mar. 15, 1836 AE 40 Yrs. Artemus Died 15 June 1861 Age 65 yrs. His Wife Anna S. (HILL) Died 15 March 1836 Age 40 yrs. George Son of _____ EARLE Died Feb. 15, 1857 AE 7 yrs. 5 mos. George EARLE Died 16 February 1857 Age 7 yrs. 5 mos. Elicy Relict of Rufus EARL Died April 22, 1880 AE 87 Yrs. Dellcy (HAZELZTON) Wife of Rufus EARLE Died 22 April 1880 Age 87 yrs. Clarinda ESELTINE Died Sept. 19, 1871 AE 59 Y'rs. Clarinda ESELTINE Died Sept. 19, 1871 AE 59 yrs. Clarinda ESELTINE Died 19 September 1871 Age 59 yrs. Mary E. Dau. of B. E. & J. C. EVEREST Died Jan. 1, 1874 Aged 3 m's. & 13 d's. Benjamin F. EVEREST Died June 7, 1858 Aged 24 Yrs. Benjamin F. EVEREST Died 7 June 1858 Aged 24 yrs. G.A.R. Byron E. EVEREST Died Aug. 17, 1916 AE 73 Y'rs. Priv. Co. B 193 Reg. N.Y.S. Vol. Inf. Byron E. EVEREST Died Aug. 17, 1916 AE 73 Yrs. Private Co. B 193 Reg. N.Y.S. Vol. Inf. David FELL Died Aug. 3, 1863 AE 38 Y'rs. David FELL Died July 30, 1863 Aged 38 Yrs. David FELL Died 30 July 1863 Age 38 yrs. David F. FIELD Died Mar. 10, 1891 AE 67 Y'rs. David F. FIELD Died Mar. 1, 1891 AE 67 Yrs. David F. FIELD Died 1 March 1891 Age 67 Yrs. David F. FIELD's obituary was published in The Malone Palladium on Thursday, 12 March 1891. Sarah L. Wife of D. F. FIELD Died July 12, 1872 AE 43 Y'rs. Sarah L. Wife of D. E. FIELD Died July 12, 1872 AE 43 Yrs. Sarah L. Wife of D. F. (D.E.?) FIELD Died 12 July 1872 Age 43 yrs. Margaret CHAMBERS Wife of David F. FIELD Died Nov. 12, 1885 AE 50 Y'rs. Margaret CHAMBERS Wife of David FIELD Died Nov. 12, 1885 AE 50 Yrs. Little Sammy Son of David F. & Sarah L. FIELD Died Mar. 31, 1870 Aged 3 Y'rs. Little Sammy Son of David E. and Sarah L. FIELD Died Mar. 31, 1870 AE 3 yrs. Little Sammy Son of David F. (E.?) and Sarah L. FIELD Died 31 March 1870 Age 3 yrs. Dea. Samuel L. FISK Died Sept. 14, 1887 AE 92 Y'rs. Deacon Samuel L. FISK Died 14 September 1887 Age 92 yrs. Samuel L. FISKE's obituary appeared in The Malone Palladium on Thursday, 22 September 1887. Lucy W. Wife of Dea. Samuel L. FISK Died March 4, 1873 AE 73 Y'rs. Lucy W. Wife of Dea. Samuel L. FISK Died 4 March 1873 Age 73 yrs. S. G. Pliny Son of Samuel L. & Lucy FISK Died 9 January 1842 Age 18 yrs. Nathaniel FISK Died Dec. 15, 1863 Aged 51 Y'rs. Nathaniel FISK Died Jany. 15, 1863 Aged 51 Yrs. Badly worn. Possible errors in copying. Heber A. Son of N. & S. A. FISK Died Aug. 30, 1848 AE 8 mo's. 23 d'ys. Darius N. FISK Died Dec. 9, 1868 AE 31 Yrs. John FLANDERS Died Apr. 20, 1907 Age 72 Y'rs. Private Co. M 2d Reg. N.Y.S. Vol. Cav'l. John FLANDERS Died 20 April 1907 Age 72 yrs. Herbert H. Died Feb. 19, 1892 AE 10 Yrs. C. Stewart Died Dec. 22, 1892 AE 13 Mos. Harrold Died Aug. 24, 1897 AE 7 Mo's. J. Arthur Died Nov. 10, 1891 AE 5 Y'rs. Louisa M. Died Feb. 14, 1892 AE 3 Y'rs. Herbert H. FOBARE Died Feb. 19, 1892 AE 10 yrs. G. Stewart FOBARE Died Dec. 22, 1892 AE 13 mos. Harrold FOBARE Died Aug. 24, 1897 AE 7 mos. Louisa M. FOBARE Died Feb. 14, 1892 AE 3 yrs. Herbert H. FOBARE Died 19 February 1892 Age 10 yrs. J. Arthur FOBARE Died 10 November 1891 Age 5 yrs. Louisa M. FOBARE Died 14 February 1892 Age 3 yrs. John L. FULLER Died July 24, 1825 AE 44 Y'rs. Sally H. Wife of John L. FULLER Died Oct. 30, 1822 AE 28 yrs. Melicent E. Wife of John L. FULLER Died Sep. 26, 1832 AE 41 Y'rs. John L. FULLER Died Died July 24, 1825 AE 44 yrs. Milicent E. Wife of John L. FULLER Died Sept. 26, 1832 AE 41 yrs. John L. FULLER Died 24 July 1825 Age 44 yrs. Sally H. Wife of John L. FULLER Died 30 October 1822 Age 28 yrs. Milicent Wife of John L. FULLER Died 26 September 1832 Age 41 yrs. Roger Lawrence Son of John L. & Milicent E. FULLER Died Feb. 24, 1826 AE 8 mo's. Roger Lawrence Son of John L. & Milicent FULLER Died Feb. 21, 1826 AE 8 mos. Archibald D. GIBSON Died 4 February 1887 Age 67 yrs. Alvira His Wife Died 12 March 1890 Age 73 yrs. Betsey Wife of Luke GLEASON Died Dec. 29, 1853 AE 67 yrs. Laura GLEASON Died July 28, 1853 AE 25 yrs. Betsey Wife of Luke GLEASON Died 29 December 1853 Age 67 yrs. Laura GLEASON Died 28 July 1853 Age 25 yrs. Sherman GLEASON Died Aug. 2, 1838 Aged 44 yrs. 6 mos. Wife: Rhoda (GOODRICH) GLEASON Died 22 December 1878 Age 81 yrs. Mrs. Rhoda GOODRICH GLEASON Departed this life Dec. 22, 1878 AE 81 Y'rs. Gone to rest. Harriet S. Daughter of Sherman and Rhoda GLEASON Died Jan. 23, 1837 Aged 11 yrs. Harriet S. Daughter of Sherman and Rhoda GLEASON Died 23 January 1837 Age 11 yrs. Mercy A. GLEASON Died Dec. 15, 1851 AE 18 yrs. & 11 mos. Mercy A. GLEASON Died Dec. 15, 1851 AE 18 yrs. 11 mos. Herbert J. Son of G. & M. GRANT Died Mar. 23, 1853 AE 2 yrs. & 2 mos. Herbert J. Son of G. & M. GRANT Died Mar. 23, 1853 AE 2 yrs. & 8 mos. Herber J. Son of G. & M. GRANT Died 23 March 1853 Age 2 yrs. 2 mos. Emily Wife of Oliver GRAVES & daughter of John & Sally ADAMS Died Apr. 7, 1844 AE 28 Y'rs. Emily Wife of Oliver GRAVES and daughter of John and Sally ADAMS Died April 2, 1844 AE 28 yrs. Emily Wife of Oliver GRAVES and Daughter of John and Sally ADAMS Died 2 April 1844 Age 28 yrs. Hannah Wife of Aaron GRIFFIN Died Dec. 14, 1862 AE 68 yrs. & 9 m.
Hannah Wife of Aaron GRIFFIS Died Dec. 14, 1862 AE 68 yrs. & 9 ms.
Hannah Wife of Aaron GRIFFIS Died 14 December 1862 Age 68 yrs. 9 mos. George Worth Son of Elisha E. & Betsey S. HALL Died Feb. 15, 1857 AE 7 yrs. & 5 mo. Catharine Frances Daughter of Francis and Elizabeth S. HARISON Died July 1st, 1825 Aged 3 yrs. 10 mos. Catharine Frances Daughter of Francis and Elizabeth S. HARISON Died 1 July 1825 Age 3 yrs. 10 mos. In memory of Jane Frances Duncan Infant daughter of Francis L. & Elizabeth HARISON who died April 4, 1813 Aged 3 weeks 1 1/2 days. God call'd you home, he saw it best. Elizabeth S. Daughter of Asa and Eunice HASCALL Died 7 August 1816 Age 2 yrs. 11 mos. There is another stone next to Elizabeth's with the top missing. AE 40 Y'rs. 6 Mos. AE 40 yrs. 6 mo. Broken stone AE 40 yrs. 6 mos. Martha Ann daughter of Russell & Sarah HATHAWAY Died March 7, 1844 Aged 8 mos. Elizabeth E. Daughter of R. & S. G. HATHAWAY Died Sept. 2, 1846 Aged 4 months. John J. Son of Russell and Sarah HATHAWAY Died 29 July 1847 Age 10 yrs. 8 mos. 24 dys. Zenas HEATH Died Dec. 16, 1853 AE 69 Yrs. Betsey Wife of Zenas HEATH Died Oct. 14, 1854 AE 61 Yrs. Zenas HEATH Died 16 December 1853 Age 69 yrs. James Son of J. G. and H. HOOPER Died July 10, 1851 AE 12 mos. 18 dys. James Son of J. G. and H. HOOPER Died 10 July 1851 Age 12 months 18 dys. Mary Wife of Obadiah HOSFORD Died 1 December 1832 Age 42 yrs. James L. Died Jan. 8, 1897 AE 18 mos. Charles H. Died May 8, 1897 AE 7 mos. Mary Wife of Oliver HOSFORD Died 5 December 1838 Age 43 yrs. An old worn stone - inscription gone. Rachel Wife of Harry HURLBURT Died 1 July 1837 AE 44 yrs. Samuel French HYDE Born Oct. 10, 1788 Died May 10, 1873 Aged 84 Y'rs. & 7 Mo's. Lucinda HYDE Born June 18, 1785 Died May 5, 1850 Aged 64 Y'rs. 10 M's. & 17 D's. Samuel French HYDE Born Oct. 10, 1788 Died May 10, 1873 Aged 84 yrs. 7 mo. Lucinda HYDE Born June 18, 1785 Died May 5, 1850 Aged 64 years 10 ms. 7 ds. John Hamilton HYDE Born April 9, 1822 Died April 3, 1867 Aged 44 yrs. 11 ms. 24 ds. Lucinda HYDE Born 18 June 1785 Died 5 May 1850 Age 64 yrs. 10 mos. 7 dys. John Hamilton HYDE Born 9 April 1822 Died 3 April 1867 Age 44 yrs. 11 mos. 24 dys. Henry S. Son of Samuel and Lucinda HYDE Died 5 May 1820 Age 1 yr. 6 mos. Margaret E. Daughter of Samuel and Lucinda HYDE Died 18 October 1828 Age 5 mos. 28 dys. Silas JOHNSON Died 5 December 1842 Age 76 yrs. Charlotte W. Wife of Silas JOHNSON Died 13 April 1842 Age 73 yrs. Sarah A. JOHNSON Died Apr. 15, 1848 Age 1 yr. 6 mos. Demerett L. JOHNSON Died Feb. 25, 1864 AE 16 yrs. Hattie M. JOHNSON Died Oct. 17, 1865 AE 15 yrs. George P. JOHNSON Died Aug. 26, 1842 AE 10 mos. 7 ds. Alzina O. Died Dec. 12, 1879 AE 28 yrs. 8 m.
George A. JOHNSON Died Apr. 12, 1891 AE 32 yrs. Sarah A. JOHNSON Died Apr. 15, 1848 AE 1 yr. 6 mos. Sarah A. JOHNSON Died 15 April 1848 Age 1 yr. 6 mos. Demerett L. JOHNSON Died 25 February 1864 Age 16 yrs. Hattie M. JOHNSON Died 17 October 1865 Age 15 yrs. George P. JOHNSON Died 26 August 1842 Age 10 mos. 7 dys. Alzina JOHNSON Died 12 December 1879 Age 28 yrs. 8 mos. George A. JOHNSON Died 12 April 1891 Age 32 yrs. There is some confusion as to whether these children belong to the JOHNSON or McKINNEY family. Maby Died 16 January 1851 In his 70th yr.
Mary JOHNSON Died 16 June 1871 Age 79 yrs. Emma Wife of W. W. JOHNSON Died Nov. 2, 1869 AE 26 Y's. & 6 M's. Entered into Rest. Henry T. JONES Died Dec. 18, 1877 AE 76 Y'rs. Farewell. In Heaven we hope to meet again. Henry T. JONES Died Dec. 18, 1877 AE 76 yrs. Henry T. JONES Died 18 December 1877 Age 76 yrs. At Rest Mary Jane Wife of Henry T. JONES Died Feb. 7, 1911 In Her 78 Yr.
Mary Jane Wife of Henry JONES Died Feb. 7, ____ In her 78 yr.
Mary Jane W. Wife of Henry JONES Died 7 February 1911 Age 76 yrs. Amanda Wife of Col. C. C. KEELER Died Sept. 17, 1865 AE 59 Y'rs. Amanda Wife of Col. C. C. KEELER Died Sept. 17, 1865 AE 59 yrs. Amanda Wife of Col. C. C. KEELER Died 17 September 1865 Age 59 Yrs. Ursula Wife of A. S. KEELER JR. Died April 3, 1886 AE 72 Y'rs. 8 M's. Andrew S. KEELER Sr. Died Aug. 7, 1879 Aged 88 Years. Andrew S. KEELER Jr. Died Aug. 3, 1879 Aged 64 yrs. Ursula Wife of A. S. KEELER Jr. Died April 3, 1886 AE 72 Yrs. 8 Mos. Andrew S. KEELER Sr. Died Aug. 7, 1879 Aged 88 yrs. Betsey Wife of A. S. KEELER Sr. Died Feb. 11, 1856 AE 64 yrs. Andrew S. KEELER Jr. Died 3 August 1879 Age 64 yrs. Ursula (MAZUZAN) Wife of Andrew S. KEELER Jr. Died 3 April 1886 Age 72 yrs. 8 mos. Andrew S. KEELER Sr. Died 7 August 1879 Age 88 yrs. Betsey Wife of Andrews S. KEELER Sr. Died 11 February 1856 Age 64 yrs. Col. Carlos C. KEELER Died Aug. 23, 1867 AE 59 Y'rs. Carlos C. KEELER Died Aug. 23, 1867 AE 59 yrs. Col. Carlos C. KEELER Died 23 August 1867 Age 59 yrs. Clarence R. Son of C. C. & A. KEELER Died Aug. 29, 1849 AE 2 yrs. Don C. KEELER Died 29 June 1897 Age 52 yrs. Son of Col. Carlos C. KEELER Brother of Hon. John Clarence KEELER, of Canton, N.Y.
Elijah KEELER Died May 27, 1835 Aged 80 Yrs. Sarah 2 Wife of Elijah KEELER Died Dec. 18, 1834 Aged 68 Yrs. Sarah 2 Wife of Elijah KEELER Died Dec. 18, 1831 Aged 68 yrs. Elijah KEELER Died 27 May 1835 Age 80 yrs. Sarah 2nd Wife of Elijah KEELER Died 18 December 1831 Age 68 yrs. Cynthia B. 2nd Wife of Elijah KEELER Born Dec. 1, 1785 Died Sept. 4, 1858 Gone to rest. Smith Died 26 July 1834 Age 1 mo. 24 dys. Elizabeth D. Wife of Wm. H. KEELER Died Mar. 29, 1854 Aged 31 yrs. Elizabeth D. Wife of William H. KEELER Died 29 March 1854 Age 31 yrs. John R. Died May 12, 1841 Aged 4 yrs. & 11 mo. Mary A. Died April 14, 1841 Aged 3 yrs. & 1 mo. John R. Died May 12, 1841 Aged 4 yrs. 11 mos. Mary A. Died April 14, 1841 Aged 3 yrs. 1 mo. John R. Died 12 May 1841 Age 4 yrs. 11 mos. Mary A. Died 14 April 1841 Age 3 yrs. 1 mo. Amanda Died 15 April 1841 Age 11 mos. 22 dys. Clarence R. Died 29 August 1849 age 2 yrs. Libbie KEELER Died 4 September 1860? Age 4 ? yrs. Lucia Amanda Daughter of C. C. & A. R. KEELER Died July 26, 1876 Aged 33 Y'rs. Lucia Amanda Daughter of C. C. & A. R. KEELER Died July 26, 1876 Aged 33 yrs. Lucia Amanda Dau. of C. C. & Ar. R. KEELER Died 26 July 1876 Age 33 yrs. Mary Wife of Carlos C. KEELER Died 11 June 1831 Age 27 yrs. Electa SMEAD KELLOGG Died Aug. 10, 1848 AE 30 yrs. Electa SMEAD KELLOGG Died 10 August 1848 Age 30 yrs. Elisha KELLOGG Died Feb. 26, 1863 AE 85 Y'rs. Elisha KELLOGG Died Feb. 26, 1863 AE 85 yrs. Nabby His Wife Died Sept. 14, 1857 In her 78 yr.
Elisha KELLOGG Died 26 February 1863 Age 85 yrs. Nabby His Wife Died 14 September 1857 In her 78th yr.
Wm. L. KELLOGG Died July 2, 1848 AE 44 yrs. William L. KELLOGG Died 2 July 1848 Age 44 yrs. Adah Wife of Apollos LATHROP Died June 21, 1823 Aged 38 yrs. Apollos LATHROP Died Aug. 10, 1848 Aged 69 yrs. Apollos LATHROP Died 10 August 1848 Aged 69 yrs. Martin L. Son of Apollos & Adah LATHROP Died Nov. 11, 1823 Aged 15 Yrs. Martin L. Son of Apollos & Adah LATHROP Died 11 November 1823 Age 15 yrs. Mary C. Daughter of Apollos & Ada LATHROP Died March 24, 1829 Aged 16 Yrs. Mary Daughter of Apollos & Adah LATHROP Died 24 March 1829 Age 16 yrs. Marion M. Wife of John LAW Died July 27, 1865 AE 19 Yrs. Marion M. Wife of John LAW Died July 27, 1865 AE 19 y.
Marion M. Wife of John LAW Died 27 July 1865 Age 19 yrs. Charlie Son of J. & S. L. LEARNED Died Feb. 20, 1848 Aged 3 yrs. Charles Son of J. & L. LEARNED Died Feb. 20, 1848 AE 3 yrs. Charles Son of J. & L. LEARNED Died 20 February 1848 Age 3 yrs. Harriet Jennet Died Mar. 24, 1821 AE 6 mos. Emeline Daughter of Josiah & Laura LEARNED Died 4 November 1823 Age 8 yrs. 2 mos. 24 dys. Laura Wife of Josiah LEARNED Died 23 May 1869 In her 71st yr.
Dau. of W. H. & F. L. LINCOLN Died June 15, 1876 AE 6 m's. 9 D's. Daughter of W. H. & F. L. LINCOLN Died June 7, 1877 AE 1 Y'r. & 4 mo's. Mr. Oliver C. LODGE was instantly killed Sept. 6, 1815 In the 35 year of his age. Is a solemn warning to you all. Charles Son of Wm. & Julia Magivney Died June 15, 1852 Aged 15 mo's. Charles Son of Wm. & Julia MACGWNEY Died June 15, 1852 Aged 15 mos. Charles Son of William and Julia MAGWNEY? Died 15 June 1852 Age 15 mos. John MAZUZAN Died Oct. 22, 1864 AE 93 Yrs. Cynthia Wife of John MAZUZAN Died Oct. 19, 1865 AE 83 Yrs. Hiram Son of John & Cynthia MAZUZAN Died Aug. 22, 1822 AE 7 Y'rs. Hiram Son of John & Cynthia MAZUZAN Died Aug. 22, 1822 AE 7 yrs. Dr. Henry MAZUZAN Died Feb. 11, 1849 AE 42 yrs. John MAZUZAN Died 22 October 1864 Age 93 yrs. Cynthia Wife of John MAZUZAN Died 19 October 1865 Age 83 yrs. Hiram Son of John & Cynthia MAZUZAN Died 22 August 1822 Age 7 yrs. Dr. Henry MAZUZAN Died 11 February 1849 Age 42 yrs. Lydia Wife of Wm. McCULLOUGH Died July 27, 1846 AE 56 yrs. William McCULLOUGH Died 14 September 1906 Age 86 yrs. Lydia Wife of Wm. McCULLOUGH Died 27 July 1846 Age 56 yrs. Ellen FERRIS Wife of James McGOWAN Died April 1, 1903 Age 80 Y'rs. Ellen FERRIS Wife of James McGOWAN Died April 1903 AE 89 yrs. Ellen FERRIS Wife of James McGOWAN Died April 1903 Age 89 yrs. James McGOWAN Died Sept. 26, 1906 AE 86 Y'rs. James McGOWAN Died Sept. 26, 1906 AE 86 yrs. James McGOWAN Died 26 September 1906 Age 86 yrs. Doctor F. Son of James & Ellen MAGOWN Died Feb. 19, 1862 AE 3 yrs. 2 mos. & 6 ds. ______ F. Son of James and Ellen McGOWAN Died Feb. 19, 1862 AE 3 yrs. 2 mos. (?) name Son of James and Ellen McGOWAN Died 19 February 1862 Age 3 yrs. 2 mos. John McGOWAN Died Sept. 6, 1841 AE 82 yrs. Nancy Nov. 18, 1863 AE 77 yrs. John M. McGOWAN Died 6 Sept. 1871 Age 82 yrs. Nancy McGOWAN Died 18 November 1863 Age 77 yrs. Wm. McKINNEY Died Nov. 3, 1869 AE 55 Yrs. Julia His Wife Died Feb. 23, 1903 AE 93 Yrs. George A. Died Apr. 12, 1891 AE 32 Yrs. Alzina O. Died Dec. 12, 1873 AE 28 Yrs. 8 mos. Sarah A. Died Apr. 15, 1848 AE 1 Yr. 6 mos. Demerett L. Died Feb. 25, 1864 AE 16 Yrs. Hattie M. Died Oct. 17, 1865 AE 15 Yrs. William McKINNEY Died 3 November 1869 Age 55 yrs. Julia His Wife Died 23 February 1903 Age 93 yrs. See the children listed under the family name of JOHNSON. There is some confusion as to whether they are this children of McKINNEY or JOHNSON. Philander MEAD Died 16 September 1851 Age 38 yrs. Lorenzo MEIGS Died Oct. 16, 1857 Ae 72 Y'rs. Lorenzo MEIGS Died Oct. 16, 1857 AE 72 yrs. Lorenzo MEIGS Died 16 October 1857 / 52 (?) Age 72 yrs. then shall I be satisfide. Mary MEIGS Died Feb. 22, 1846 AE 57 yrs. Mary MEIGS Died 22 February 1846 Age 57 yrs. Olive Wife of Isaac MERIAM Died May 31, 1855 Aged 77 Y'rs. Olive Wife of Isaac MERRIAM Died 3 May 1855 Age 77 yrs. Obit says: Died at residence of his son, Luther MILLER, in Burke, 23 August 1883, in his 85th yr.
Samuel MILLER's obituary was published in The Malone Palladium on Thursday, 6 September 1883. Jane Daughter of J. & R. MILLER Died Aug. 27, 1858 AE 4 yrs. & 9 mos. Jane Daughter of J. & R. MILLER Died 27 August 1858 Age 4 yrs. Mary Wife of Porter MOODY Died Feb. 5, 1881 Aged 90 yrs. Porter MOODY Died Jan. 2, 1872 AE 83 Y'rs. Porter MOODY Died Jan. 2, 1872 AE 83 yrs. Porter MOODY Died 2 January 1872 Age 83 yrs. Rebecca Wife of Noah MOODY Died May 15, 1814 In the 47th year of her age. Helen MOREHOUSE Died May 22, 1890 AE 80 Yrs. Helen MOREHOUSE Died 22 May 1890 AE 80 Yrs. Possibly mother of Mary JONES. Maj. Wm. A. NAY Died Sept. 9, 1858 AE 84 Y'rs. Major William A. NAY Died Sept. 9, 1858 AE 81 Yrs. Major William A. NAY or NOY Died 9 September 1858 Age 81 yrs. Betsey Wife of Maj. Wm. A. NAY Died Jan. 28, 1867 AE 87 Y'rs. Betsey Wife of Major Wm. A. NAY Died Jan. 28, 1867 AE 87 Yrs. Betsey Wife of Major Wm. A. NAY or NOY Died 28 January 1867 Age 87 yrs. Nathan NAY Feb. 24, 1793 - June 18, 1874 Co. H. U.S. Inf. Anna Jane Daughter of Elisha & Lucy NICHOLS Died May 1821 Aged 2 yrs. Anna Jane Daughter of Elisha and Lucy NICHOLS Died May 1821 Age 2 yrs. James L. Died Jan. 8, 1897 AE 18 Mo's. Charles H. Died May 8, 1897 AE 7 Mo's. James Died Jan. 8,1897 AE 18 mos. Charles Died May 8, 1897 AE 7 mos. Abiah Wife of Rev. Stephen PADDOCK Died 13 October 1853 In her 61st yr.
Carroll C. Son of S. & A. PADDOCK Died May 26, 1839 AE 2 Y'rs. & 1 mo. Carrol G. Son of Rev. Stephen & Abiah PADDOCK Died 26 May 1839 Age 2 yrs. 1 mo. Elizabeth H. Daughter of Thomas J. & Eunice C. PADDOCK Died Mar. 27, 1848 AE 24 yrs. Elizabeth Daughter of Thomas & Eunice C. PADDOCK Died Mar. 27, 1848 AE 24 yrs. Elizabeth Daughter of Thomas and Eunice PADDOCK Died 27 March 1848 Age 24 yrs. Eunice Wife of Thomas PADDOCK Died 11 August 1833 In her 42nd yr.
George Son of Thomas & Eunice PADDOCK Died 30 March 1831 Age 6 yrs. Mary Wife of Thomas J. PADDOCK Died Feb. 6, 1853 AE 53 yrs. Mary Wife of Thomas PADDOCK Died 6 February 1853 Age 53 yrs. Rev. Stephen PADDOCK Died April 28, 1858 In the 72nd Year of his Aged. man, and the glory of God. Rev. Stephen PADDOCK Died 28 April 1858 In his 72nd yr.
Thankful Wife of William PADDOCK Died June 1837 In her 81st yr.
Thomas J. PADDOCK Died April 2, 1859 In the 68th year of his age. Thomas PADDOCK Died April 2, 1859 In the 68th year of his age. Thomas PADDOCK Died 2 April 1859 In his 68th yr.
William PADDOCK Died Oct. 27, 1818 In the 70th year of his age. Died 27 October 1818 In his 70th yr.
Ashbel PARMELEE D.D. Died May 24, 1862 AE 77 yrs. Ashbel PARMELEE D.D. Died 24 May 1862 Age 77 yrs. Betsey 3rd Wife of Rev. A. PARMELEE Died 20 June 1864 Age 70 yrs. Horace M. PARMELEE Died April 28, 1851 Aged 30 yrs. Horace M. PARMELEE Died 28 April 1851 Age 30 yrs. Harlow Son of Samuel & Huldah PECK Died Feb. 10, 1837 Aged 28 Yrs. Harlow Son of Samuel and Huldah PECK Died Feb. 10, 1837 Aged 28 yrs. Harlow Son of Samuel and Huldah PECK Died 10 February 1837 Age 28 yrs. Harriett Wife of Reeve PECK Jr. Died Aug. 23, 1864 Aged 71 Yrs. Harriet Wife of Reeve PECK, Jr. Died Aug. 23, 1864 Aged 71 yrs. Harriet Wife of Reeve PECK, Jr. Died 23 August 1864 Age 71 yrs. Huldah Wife of Saml. PECK Died July 17, 1825 In the 41 year of her age. Huldah Wife of Samuel PECK Died July 17, 1825 In the 41 yr. of her age. Huldah Wife of Samuel PECK Died 17 July 1825 In her 41st yr.
Reeve PECK Died Sept. 15, 1830 In the 79 year of his age. Reeve PECK Died 15 September 1830 In his 79th yr.
Reeve PECK Died Sept. 22, 1830 Aged 48 Yrs. Reeve PECK Died Sept. 22, 1830 Aged 18 yrs. Reeve PECK Died 22 September 1830 Aged 18 yrs. Samuel PECK Died Oct. 15, 1853 Aged 55 yrs. Samuel PECK Died 15 October 1853 Age 55 yrs. Samuel Son of Samuel & Huldah PECK Died Augt. 10, 1825 In the 5 year of his age. Samuel Son of Samuel & Huldah PECK Died 10 August 1825 In his 5th yr.
John PERRIN Died June 1, 1861 AE 82 yrs. John PERRIN Died June 4, 1861 AE 82 Yrs. John PERRIN Died 4 June 1861 Age 82 yrs. Sarah Wife of John PERRIN Died Oct. 24, 1844 Aged 63 Yrs. Sarah Wife of John PERRIN Died 24 October 1844 Age 63 yrs. Sarah M. Died June 20, 1877 Aged 61 yrs. Sarah M. PERRIN Died 20 June 1877 Age 61 yrs. Stephen PERRIN Died 23 December 1870 Age 62 yrs. Thankful W. Daughter of John & Sarah PERRIN Died Feb. 11, 1844 Aged 37 Y'rs. Thankful Daughter of John & Sarah PERRIN Died Feb. 11, 1844 Aged 37 Yrs. Thankful Daughter of John and Sarah PERRIN Died 11 February 1844 Age 37 yrs. Henry J. PERRN Died Mar. 7, 1892 AE 70 Y'rs. Gone but not forgotten. Henry J. PERRIN Died Mar. 7, 1832 AE 70 Yrs. Henry J. PERRIN Died 7 March 1832 Age 70 yrs. Jerusha Wife of Daniel PERRY Died 25 January 1859 In her 65th yr.
Sarah Jane PERRY Died Aug. 6, 1855 In her 20 year. Sarah Jane PERRY Died 6 August 1855 In her 20th yr.
Elizabeth CAMPBELL Wife of James PETERS Died May 21, 1892 In her 85th Year. Blessed are the dead which die in the Lord. Elizabeth CAMPBELL Wife of James PETERS Died 21 May 1892 In her 85th yr.
Mrs. Eliza F. (PHELPS) CORNISH's obituary was published in The Malone Palladium on Thursday, 2 March 1882. Sacred to the memory of Sarah Elizabeth Daughter of Asahel & Fanny PHELPS Died May 1, 1845 AE 2 yrs. 2 mos. Thomas REA Died Jan. 22, 1875 AE 69 Y'rs. Asenath A. Relict of Tho's. REA Died May 13, 1897 AE 86 Y'rs. Thomas Died Jan. 22, 1875 AE 69 Yrs. Asenath A. Relict of Thomas REA Died May 13, 1897 AE 86 Yrs. Thomas Died 22 January 1875 Age 69 yrs. Asenath A. Relict of Thomas REA Died 13 May 1897 Age 86 yrs. Mrs. Asenath REA's obituary was published in The Malone Palladium on Thursday, 20 May 1897. Henry REMINGTON Died Dec. 25, 1865 AE 42 Yrs. Co. A. 93 Reg. N.Y.S.I. Mary L. Daughter of G. H. & A. L. REXFORD Died Sep. 24, 1857 AE 14 Wks. David H. RICE Died Apr. 8, 1914 AE 77 Y'rs. Priv. Co. C 93 Reg. N.Y.Vol. Inf. David RICE Died Apr. 8, 1914 AE 77 Yrs. Priv. Co C 93 Reg. N.Y.Vol. Inf. broken piece that says "
Anna Wife of John RUSSELL Died 26 May 1833 Age 50 yrs. Sacred to the memory of James Son of J. A. & Sarah RYDER Who departed this life June 24, 1874 AE 21 Y'rs. Thy Brother shall rise again. James Son of J. A. & Sarah RYDER Died June 24, 1874 AE 21 yrs. James Son of J. A. & Sarah RYDER Died 24 June 1874 Age 21 yrs. Wm. SABIN Died Jan. 21, 1854 AE 83 Yrs. William SABIN Died Jan. 21, 1854 AE 83 Yrs. Sarah His Wife Died Feb. 18, 1851 AE 85 Yrs. William SABIN Died 21 January 1854 Age 83 yrs. Sarah Wife of Wm. SABIN Died Feb. 18, 1854 AE 85 yrs. Sarah Wife of William SABIN Died 18 February 1851 Age 85 yrs. Mary R. Daughter of Wm. & Olive SABIN Died May 25, 1854 AE 24 Yrs. Mary R. Daughter of William & Olive SABIN Died May 25, 1851 Aged 24 yrs. Mary R. Daughter of William & Olive SABIN Died 25 May 1851 Age 24 yrs. William SABIN Jr. Died Apr. 5, 1865 Aged 63 yrs. William SABIN Jr. Died 5 April 1865 Age 63 yrs. Olive SABIN Died Aug. 9, 1868 Age 71 yrs. Olive SABIN Died Aug. 9, 1868 Aged 71 yrs. Olive Died 9 August 1868 Age 71 yrs. Col. Joseph SAFFORD Died Jan. 4, 1808 Aged 68 Y'rs. An honest man, the noblest work of God. Alzina Daughter of Major Joel AMSDEN Wife of James A. SAWYER Died Nov. 24, 1841 Aged 33 Yrs. Alzina (AMSDEN) Wife of James SAWYER Died 24 November 1841 Age 33 yrs. T'is not to die to live in hearts we leave behind. James SAWYER Died Sept. 27, 1855 AE 50 Yrs. Ephraim SCHOOLCRAFT Died Sept. 1, 1885 AE 45 Y'rs. Ephraim Died Sept. 1, 1885 AE 46 yrs. Ephraim SCHOOLCRAFT Died 1 September 1885 Age 46 yrs. Philip SCHOOLCRAFT Died Jan. 23, 1860 AE 62 Y'rs. Philip SCHOOLCRAFT Died Jan. 23, 1860 AE 62 yrs. Philip SCHOOLCRAFT Died 23 January 1860 Age 62 yrs. Eviline Wife of Philip SCHOOLCRAFT Died Aug. 8, 1866 AE 61 Y'rs. & 5 M's. Eveline Wife of Philip SCHOOLCRAFT Died Aug. 8, 1866 AE 61 Yrs. 5 Ms.
Philip SCHOOLCRAFT Died 8 August 1866 Age 61 yrs. 5 mos. Willie D. Son of C. C. & H. E. SCHOOLCRAFT Died Jan. 9, 1867 AE 2 Y'rs. & 6 ms.
Willie D. Son of C. C. & H. E. SCHOOLCRAFT Died Jan. 9, 1867 AE 2 yrs. & 6 mos. Willie D. Son of C. C. & H. E. SCHOOLCRAFT Died 9 January 1867 Age 2 yrs. 6 mos. John Carlo Son of Luke & Electa SEELEY Died February 19, 1822 In the 4 year of his age. John Carlos Son of Luke & Electa SEELEY Died 10 February 1822 In his 4th yr.
Rev. Hiram SHEPARD Of Black River Conference Died May 25, 1862 AE 57 Y'rs. He died in the Lord. Amanda BUTTERFIELD Wife of Hiram SHEPARD Born April 22, 1811 Died Aug. 27, 1880 He giveth his beloved sleep. Daniel SHERWIN Died 23 May 1855 Age 74 yrs. Maby Wife of Daniel SHERWIN Died 7 April 1864 Age 75 yrs. Now rest, husband, rest thee in Heaven. Josiah Son of L. A. & Z. W. SIMONS Co. H. 106 Reg. N.Y. Vol. Died at North Mountain VA May 27, 1863 Aged 17 Years At rest, for God hath willed it so. Shubel Son of L. A. & Z. W. SIMONS 1st Sergt. Co. H. 10 Reg. Iowa V. Died at Davenport Iowa Nov. 2, 1863 Aged 24 Years. Josiah Son of L. A. & Z. W. SIMONS Co. H. 106 Reg. N.Y. Vol. Died at North Mountain, Va. May 27, 1863 Aged 17 yrs. Shubel Son of L. A. & Z. W. SIMONS 1st Sgt. Co. H 10 Reg. Iowa V. Died Davenport, Iowa Nov. 2, 1863 Aged 24 yrs. Josiah SIMONS Died at North Mountain, Virginia 27 May 1863 Age 17 yrs. Co. H 106 Regiment, N.Y. Vol. Click here to see Zerviah SIMONS's obituary, which was published in The Palladium on Thursday, 21 Jan. 1897. Alonzo Son of H. T. & A. J. SLACK Died Oct. 1, 1898 AE 1 Mo. Raymond E. Son of H. & A. SLACK Died Aug. 8, 1911 Age 6 Mo's. Raymond Son of H. & A. SLACK Died Aug. 8, 1911 Age 6 mos. Obit says: Died in Malone, Wesley A. on 29 June 1901, son of Henry and Agnes (ROGERS) SLACK, age 6 months. Electa SMEAD Died Aug. 10, 1848 AE 30 yrs. (NOTE: The D.A.R. transcription lists this stone underneath KELLOGG.). Lucius SMITH Died May 24, 1880 AE 77 Y'rs. Mary Wife of Lucius SMITH Died Sept. 10, 1878 AE 76 Y'rs. Lucius SMITH Died May 24, 1880 AE 77 yrs. Mary Wife of Lucius SMITH Died Sept. 10, 1873 AE 73 yrs. Lucius SMITH Died 24 May 1880 Age 77 yrs. Mary Wife of Lucius SMITH Died 10 September 1873 Age 73 yrs. Hiram J. Died Dec. 17, 1847 Aged 25 yrs. Hiram J. Died 17 December 1847 Age 25 yrs. Asa L. STICKNEY Died Mar. 19, 1851 AE 56 Y'rs. Asa L. Died Mar. 19, 1857 Aged 56 Yrs. Asa L. Died 19 March 1857 Age 56 yrs. Josephine His Wife Died Aug. 3, 1903 Age 63 Y'rs. Gertrude G. Dau. of J. J. & J. G. TALLMAN Died Sept. 11, 1900 Age 1 y'r. & 12 D'ys. At Rest. Lefea Wife of Elihu THOMAS Died Dec. the 14th 1809 In the 19th year of her age. Lepha / Lefa Wife of Elihu THOMAS Died 11 December 1809 In her 19th yr.
Johnathan THOMAS Died Nov. 12, 1850 In his 47 year. God cal'd you home he thought it best. Jonathan THOMAS Died 12 November 1850 In his 47th yr.
Anna H. Wife of Jonathan THOMAS Died 17 October 1882 In her 87th yr. In the way our fathers trod. In memory of Mrs. Sally Wife of Doct. Paul THORNDIKE Who departed this life Dec. 18th 1822 Aged 39 years. Mrs. Sally Wife of Paul THORNDIKE Who departed this life Dec. 18, 1822 Age 39 yrs. Sally Wife of Paul THORNDIKE Died 18 December 1822 Age 39 yrs. Sally Daughter of Paul & Sally THORNDIKE Who departed this life May 1812 Age 10 yrs. Sally Daughter of Paul & Sally THORNDIKE Died May 1812 Age 10 yrs. Thomas L. C. TRUMBLE Died Nov. 5, 1854 AE 53 Yrs. Caroline A. TRUMBLE Died Oct. 27, 1856 AE 20 Y'rs. I must sleep here till Christ appears. Abner D. TYLER Died May 1840 Age 54 yrs. Charles W. Son of W. W. & A. A. VAUGHAN Died Aug. 16, 1886 AE 10 Mo's 7 D'ys. Charles W. VAUGHN Son of W. A. & A. A. VAUGHN Died April 16, 1880 AE 10 mos. 2 dys. Bertha Dau. of E. H. & L. WALLER Died 23 August 1874 AE 4 mos. 22 dys. Adaline SPENCER Daughter of Dr. Henry S. & Lucinda WATERHOUSE Died Sept. 7, 1815 Aged 4 yrs. & 5 mos. Adaline SPENCER Daughter of Dr. Henry S. & Lucinda WATERHOUSE Died 7 September 1815 Age 4 yrs. 5 mos. Catharine Daughter of Henry S. and Lucinda WATERHOUSE Died 17 August 1822 Age 2 yrs. 5 mos. Charles Wood Son of Dr. Henry & Sally WATERHOUSE Died June 15, 1811 Age 12 mos. Richard Son of Dr. Henry S. & Lucinda WATERHOUSE Died 12 August 1822 Age 2 yrs. 5 mos. Sally W. Daughter of John & Sarah WOOD & Wife of Dr. Henry S. WATERHOUSE Died July 21st 1810 Aged 42 years. And that dear cherub thou hast left below. Sally W. Daughter of John and Sarah WOOD and Wife of Dr. Henry WATERHOUSE Died July 21, 1810 Aged 42 yrs. Sally W. Daughter of John and Sarah WOOD and Wife of D. Henry S. WATERHOUSE Died 21 July 1810 Age 42 yrs. William Henry Son of Dr. Henry S. & Lucinda WATERHOUSE Died 7 September 1817 Age 1 yr. 6 mos. Jared WATKINS Died Dec. 15, 1807 AE 45 Y'rs. Also Hannah His Wife Died July 3, 1852 AE 86 Y'rs. Jared WATKINS Died Dec. 15, 1807 AE 45 yrs. Jared WATKINS Died 15 December 1807 Age 45 yrs. Hannah His Wife Died 3 July 1852 Age 86 yrs. So fades this lovely blooming flower. Henry D. Son of Elias & Susan WATKINS Died Feb. 3, 1834 Aged 2 yrs. 6 mo. 24 ds. Henry Son of Elias & Susan WATKINS Died 3 February 1834 Age 2 yrs. 6 mos. 24 dys. Elias WATKINS Died Apr. 14, 1881 AE 90 Y'rs. Susan His Wife Died Mar. 12, 1860 AE 71 Y'rs. Elias WATKINS Died April 14, 1881 AE 90 yrs. Susan His Wife Died Mar. 12, 1860 AE 71 yrs. Susan His Wife Died 12 March 1860 Age 71 yrs. Marsellus WATKINS Died Jan. 16, 1879 AE 36 Yrs. Polly Wife of Asaph WATKINS. John WEBSTER 1842 - 1913 Priv. Co. C. 98 Co. H 106 N.Y. Vol. Member Brennan Post G.A.R. John WEBSTER 1842 - 1913 Priv. Co. C 98 Co. H 106 N.Y. Vol. Testimonial of the virtues & worth of Maria, late consort of Almon WHEELER Esqr. who departed this life on the 5th of July 1813. In the 18th year of her age. Testimonial of the virtue and worth of Maria, late consort of Almon WHEELER, Esq. who departed this life on the 5th of July 1813, in the 18th year of her age. On this lot a very old stone marked P.S. Testimonial of the virtue and worth of Marie, late consort of Almon WHEELER, Esq., who departed this life on the 5th July 1813 in the 18th year of her age. Betsey Wife of Nahum WHIPPLE Died Jan. the 11th 1815 In the 23rd year of her age. Betsey Wife of Nahum WHIPPLE Died 11 January 1813 In her 25th yr.
Edgar WHIPPLE Died 11 September 1888 In his 30th yr.
Edna Daughter of O. W. & D. A. WHIPPLE Died 10 December 1851 Age 1 yr. 14 dys. Thou hast gone to rest dear mother. Eunice Wife of Nahum WHIPPLE Born in Hardwick, Massachusetts 1759 Died Sept. 8, 1825 Aged 66 yrs. Eunice Wife of Nahum WHIPPLE Born in Hardwick, Massachusetts 1759 Died 8 September 1825 Age 66 yrs. Nahum WHIPPLE Died Oct. 3, 1840 AE 52 years. Father we will not forget thee. Nahum WHIPPLE Died 3 October 1840 Age 52 yrs. Delia A. His Wife Died June 2, 1856 AE 36 Y'rs. Delia A. His Wife Died June 2, 1856 AE 36 yrs. Oliver WHIPPLE Died 3 May 1888 (heart disease) Iin his 75th yr.
Delia A. (HOLMES) His Wife Died 2 June 1856 Age 36 yrs. Silas S. WHIPPLE Son of the late Nahum WHIPPLE Died Dec. 24, 1897 In his 78 Y'r. Harriet His Wife Died Jan. 16, 1902 In her 75 Y'r. Silas S. WHIPPLE Died 24 December 1897 In his 87th yr.
Died in Whippleville, 16 January 1902, of consumption, Harriet (BASSETT) WHIPPLE, wife of Silas S. WHIPPLE, age 74 yrs. He died 4 years before. Harriet (BASSETT) Wife of Silas S. WHIPPLE Died 16 Jan. 1902 In her 75th yr.
Harriet (BASSETT) WHIPPLE's obituary appeared in The Malone Farmer on Wednesday, 22 January 1902. Dea. Paul WHITE Died Aug. 31, 1860 AE 95 Yrs. Deacon Paul WHITE Died 31 August 1860 Age 95 yrs. Polly Wife of Paul WHITE Died Jan. 25, 1858 AE 91 Yrs. Polly Wife of Paul WHITE Died 25 January 1858 Age 91 yrs. Dorcas Wife of Abijah WHITE Died Aug. 26, 1844 AE 54 Yrs. Dorcas Wife of Abiah WHITE Died 26 August 1844 Age 54 yrs. Sophia Wife of A. S. WHITE Died Sept. 19, 1853 AE 48 Y'rs. Lavinia Wife of A. S. WHITE Died July 13, 1862 AE 58 Y'rs. Henry P. Son of A. S. & S. WHITE Died Nov. 23, 1849 AE 18 Y'rs. Lawson H. Son of A. S. & S. WHITE Died Jan. 14, 1853 AE 17 Y'rs. Lavinia Wife of A. S. WHITE Died July 13, 1862 AE 58 yrs. Henry P. Son of A. S. WHITE Died Nov. 23, 1849 AE 18 yrs. Lavinia Wife of A. S. WHITE Died 13 July 1862 Age 58 yrs. Henry P. Died 23 November 1849 Age 18 yrs. Lawson H. Died 14 January 1853 Age 17 yrs. Lucy Wife of Nathan WHITE Died Nov. 21, 1842 Aged 48 yrs. Lucy Wife of Nathan WHITE Died 21 November 1842 Age 48 yrs. Louisa A. Daughter of N. & L. WHITE Died May 11, 1819 Aged 3 yrs. Louisa A. Dau. of N. & L. WHITE Died 11 May 1819 Age 3 yrs. W. Henry Son of N. & L. WHITE Died 9 April 1823 Age 3 yrs. George H. Son of N. & L. WHITE Died Nov. 3, 1825 Aged 2 mo's. & 17 d's. George Son of N. & L. WHITE Died 3 November 1825 Age 2 mos. 17 dys. Rodney Son of N. & L. WHITE Died 1 January 1822 Age 3 mos. 14 dys. Adeline R. Dau. of N. & L. WHITE Died 2 May 1843 Age 15 yrs. Adin WILLIAMS Died Aug. 11, 1874 Aged 49 Y'rs. Lucy A. Wife of Adin WILLIAMS Died Nov. 8, 1888 AE 56 yrs. Winnafred Died July 23, 1863 Aged 7 Y'rs. 6 Mo's. Adin WILLIAMS Died Aug. 11, 1874 Aged 49 yrs. Winifred Died July 23, 1863 Aged 7 yrs. 6 mos. Adin WILLIAMS Died 11 August 1874 Age 49 yrs. Lucy A. (FISK) Wife of Adin WILLIAMS Died 8 November 1888 Age 56 yrs. Nellie V. Dau. of S. H. & Julia WILLIAMS Died Mar. 12, 1871 AE 2 Y's. 2 M 7 D's. Nellie V. Daughter of S. H. & Julia WILLIAMS Died Mar. 12, 1871 AE 2 yrs. 2 m. 7 d.
Nellie V. Dau. of S. H. & Julia WILLIAMS Died 12 March 1871 Age 2 yrs. 2 mos. 7 dys. Maudie WILLETT Died May 14, 1889 AE 45 yrs. Maudia (?) WILLITT Died 14 May 1889 Age 45 yrs. Abel WILLSON Died 18 February 1854 In his 69th yr.
Ann M. Wife of Abel WILLSON Died Jan. 20, 1881 AE 80 Y'rs. Anna Wife of Abel WILLSON Died Jan. 20, 1881 AE 80 Yrs. Anna Wife of Abel WILLSON Died 20 January 1881 In her 83rd yr.
Kittie Died Aug. 15, 1876 AE 2 yrs. 3 mos. 28 dys. Kittie E. Died 15 October 1876 Age 2 yrs. 3 mos. 28 dys. Lucinda Wife of Abel WILLSON Died Oct. 2, 1822 In the 37 year of her age. Lucinda Wife of Abel WILLSON Died 2 October 1822 In her 37th yr.
Mary Antoinette Daughter of Abel & Lucinda WILLSON Died Jan. 12, 1834 In the 19 year of her age. Mary Antoinette Dau. of Abel and Lucinda WILLSON Died 12 January 1834 In her 19th yr.
Sibbel Wife of Henry WINCHESTER Died Jan. 15, 1813 Aged 22 yrs. Sibbel Wife of Henry WINCHESTER Died 15 January 1813 Age 22 yrs. Lois Wife of Henry WINCHESTER Died 16 May 1812 In her 90th yr.
Little Elijah Infant son of H. A. & I. R. WOLFE Died Aug. 31, 1872 AE 3 mo's 27 D's. Little Elijah Infant son of H. A. & I. R. WOLFF Died Aug. 31, 1872 AE 3 mos. 27 dys. Little Elijah Son of H.. & I. R. WOLFF Died 31 August 1872 Age 3 mos. 27 dys. Ebenezer WOOD Died Aug. 1, 1830 AE 50 y'rs. Elizabeth His Wife Died Jan. 14, 1863 AE 88 Y'rs. This mortal shall put on immortality. Ebenezer WOOD Died Aug. 1, 1830 AE 70 yrs. Ebenezer WOOD Died 1 August 1830 Age 70 yrs. Malone WOOD Died Jan. 9th, 1808 Aged 6 yrs. & 10 months (NOTE: Handwritten above "Malone" is "Nathan." Eliza WOOD Died 10 March 1810 Age 7 yrs. 10 mos. Nathan WOOD Died 9 January 1808 Age 6 yrs. 10 mos. Enos WOOD's obituary was published in The Malone Palladium on Thursday, 23 Jan. 1851. Esther WOOD Died May 3, 1875 AE 86 Yrs. Adin WOOD Died Jan. 10, 1857 AE 72 yrs. Esther WOOD Died 3 May 1875 Age 86 yrs. John R. WOOD Died Jan. 18, 1825 AE 21 Yrs. Ann Elizabeth Dau. of L. M. & A. B. WOOD Died Sept. 29, 1853 AE 13 Y'rs. John A. Son of L. M. & A. B. WOOD Died Oct. 10, 1885 AE 54 Y'rs. Ann Elizabeth Daughter of L. M. & A. B. WOOD Died Sept. 29, 1853 AE 13 yrs. John A. Son of L. M. & A. B. WOOD Died Oct. 10, 1858 AE 54 yrs. Ann Elizabeth Daughter of L. M. & A. B. WOOD Died 29 September 1853 Age 13 yrs. John A. WOOD Son of L. M. & A. B. WOOD Died 10 October 1858 Age 54 yrs. Laura Wife of Nathaniel WOOD Died Jan. 27, 1866 AE 55 Y'rs. Laura Wife of Nathaniel WOOD Died Jan. 27, 1866 AE 55 yrs. Laura Wife of Nathaniel WOOD Died 27 January 1866 Age 55 yrs. Nathaniel WOOD Died 26 July 1876 In his 71st yr.
Nelson P. Son of Nathaniel & Laura WOOD Died Aug. 30, 1862 AE 18 Y'rs. & 3 m.
Nelson P. Son of Nathaniel & Laura WOOD Died Aug. 30, 1862 AE 18 yrs. Nelson P. Son of Nathaniel & Laura WOOD Died 30 August 1862 Age 18 yrs. Safford C. WOOD Died April 13, 1830 AE 16 Yrs. Safford WOOD Died Jan. 18, 1825 AE 25 yrs. Safford WOOD Died 18 January 1825 AE 25 yrs.